Thereby hangs a tale, I'm sure! Young and handsome and he's got all the chicks' attention. Of course the miserable looking old geezer helps the appeal. What are the blue floatie thingies? Wonderful work as always, and the faces have such character. And to think I gave up my aspirations for a career in academia. . . A Roger Moore type perhaps? Wonder what would happen in the teachers' lounge if Sean Connery got a job there. It's fascinating, I have NEVER seen anyone try to paint that malady of the eye. Very ambitious. And quite a contrast between your story in the room and the one behind your own eyes. If it reflects your vision, I wish you good health. 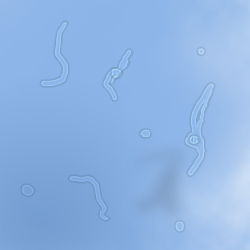 Hmmm, my floaters are black spotty/stringy things. I've learned something new today. As usual a great illustration I wonder what size his shoes are ? My mother was a school librarian at the school where I studied.